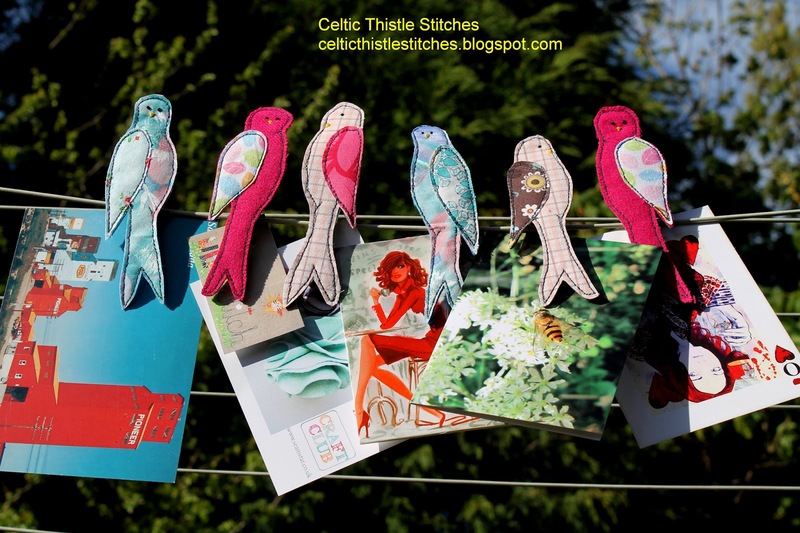 It is finally my day to join in the fun on the It's for the Birds Blog Hop organised by the superbly efficient Madame Samm of Sew We Quilt and Mary of I Piece 2-Mary, the cheerleading head of the flock. Thanks ladies! If you are new to my blog, welcome, I hope you enjoy the projects I have today and feel free to wander around and explore my little patch of Blogland. I have been itching to try my hand at Freehand Machine Embroidery for a while but hadn't plucked up the courage. 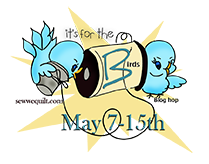 So when Madame Samm announced the It's for the Birds Blog Hop I decided that the time had come. I already had the perfect bird-themed projects thanks to Helen at Bustle and Sew. We recently spent a lovely weekend with my brother and sister-in-law at their chalet on the East Coast of Scotland. Amazingly the weather was kind to us so we were able to enjoy these glorious views. I wanted to make a special present to thank them for their great hospitality and Bustle and Sew's Seagull Cushion fitted the bill perfectly. Having never tried Freehand Machine Embroidery before I was a bit wary but it couldn't have been more enjoyable, thanks to Helen's lovely pattern and great instructions.The embroidered seagull was really straightforward to put together, even for a complete beginner like me. Having tackled the first challenge of this cushion, the second was to try printing on fabric for the first time. I used this Transfer Artist Paper. 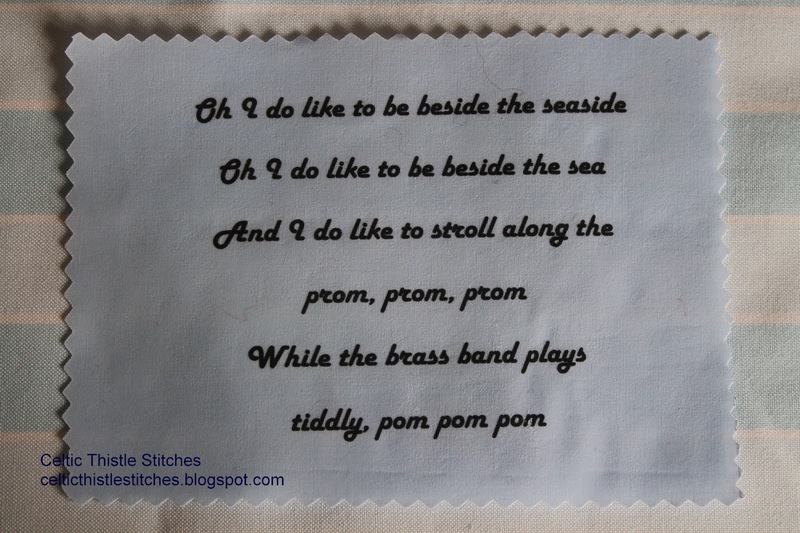 I printed the lyrics out in reverse and then ironed the image onto a piece of plain blue cotton. The text transferred perfectly. 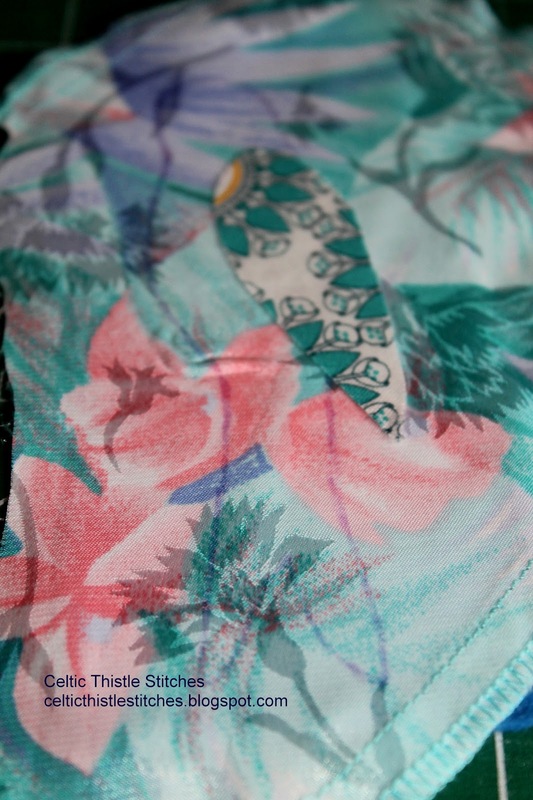 I hadn't realised just how stiff the fabric would be as a result of the image transfer, which meant that any needle/pin holes remained after the pins were removed as you can see below. I might try another method of image transfer next time, and there will be a next time as I was so thrilled with how this cushion turned out that I plan to make one for myself. Emboldened by the success of the Freehand Machine Embroidery on the Seagull Cushion I decided to have a go at "Birds on a Wire". These were so much fun to make. As regular readers will know I love to upcycle fabric, usually from my husband and sons' shirts, so you can guess where the check fabric came from for the birds! Just for a change this time I also raided my own wardrobe; the aqua fabric was originally the pocket of one of my old dressing gowns! The body fabric pieces were backed with fusible web and then ironed to felt and then the outline of each bird was traced on with an air-erasable marker. You can just see the outline in the photo above. The wing fabrics were backed with fusible web and then attached to the body fabric. The machine embroidered outline was completed and then the bird shapes were cut out. This was such an easy way to manage the potentially fiddly bird tails. Glued to wooden clothes pegs and they are all ready to perch. Don't they look like they are having a good gossip on the line? These will be so handy in my sewing room, but I think they would look great in a girly bedroom too. Thanks to the lovely Helen, they could be decorating your sewing room or bedroom too. Helen has generously donated three Bustle and Sew PDF patterns for one lucky winner. 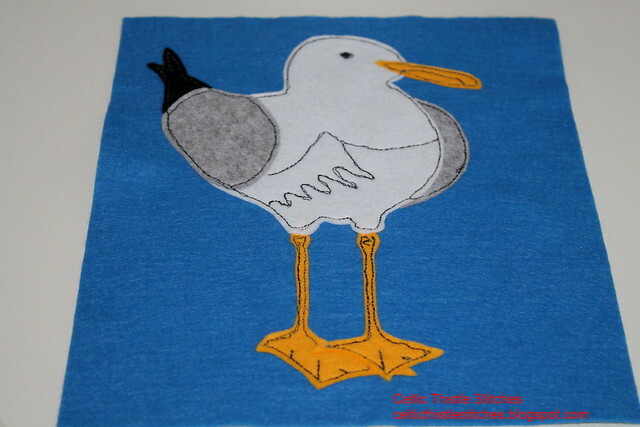 The winner will receive a copy of the Birds on a Wire pattern, Seagull Cushion Cover pattern and, in keeping with the It's for the Birds Blog Hop theme a copy of this Summer Birdie Bag pattern too! So what do you have to do to win these great patterns? Simply fly over to the Bustle and Sew website and check out Helen's patterns then fly back to leave a comment telling me which Bustle and Sew pattern you would like to tackle. If you are a follower tell me that in a second comment for an extra chance to win.The winner will be drawn randomly on Monday, May 19th at 18.00 GMT. Please leave your email address in the form commenteratgmaildotcom in your comment if you are a no-reply blogger. In the event that the winner is a no-reply commenter and I cannot find a way to contact you I will redraw, sorry! If you try something new this month don't forget to come back and link up to my monthly New to Me in 2013 link party on May 25th! Check out these other Blog Hoppers posting more great bird-themed projects today too. Your projects are wonderful!! I love the cushion and the birds are delightful...I like the Elephant blocks in the shop. Thanks for a nice giveaway. 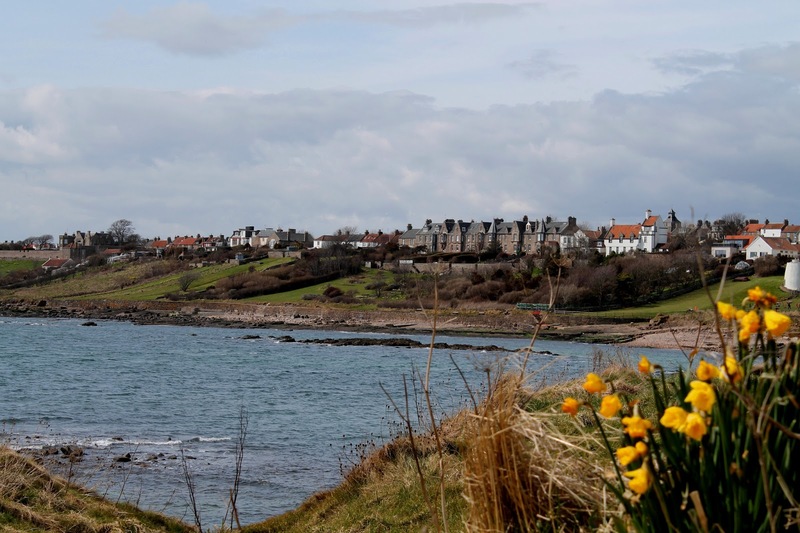 My Mom is from Scotland; I love seeing pictures. Oh forgot; next time you want to transfer....try printable fabric sheets. I use the jacquard inkjet sheets...they are fairly soft. Love your Seagull and the birds on a wire is sew cute! Thank you for sharing. Very cute birds! The seagull is my favorite. Your birds are super. Great job. Thank you so much for being part of this hop. Gorgeous projects - I love them. Thanks for the lovely giveaway - I like the cotton spool mice - too cute! Oh my goodness, Fiona! They are sooo cute! I love the seagull with the little banners flapping on the side of the pillow. I really love the birds on a wire. That would be perfect for my little sewing area. That is my favorite pattern! I, of course, follow you via email. Thanks for the giveaway! I would love to make the teacup applique pattern. :) Predictable, huh? I think the needle holes add a nice texture. It looks like you planned it that way. I like the mice pattern. Love, love, love your seagull. Next time try printing onto prepared fabric straight from printer. EQ Printables do a pack of A4 fbric ready to print. Thank you for link to Bustle & Sew, have subscribed to their newsletter and am tickled by the Fabric Deer Head! And of course, I already follow you. I like the Elephant blocks. Thank you for such a detailed post. Very cute, love that seagull pattern and I know of someone that would love to have it! I love your birds! The seagull cushion is just lovely. I love your seagull. Jonathan Livingston I presume. The birds on a wire are fun too. I like the weekday elephants at Bustle and Sew. I love elephants! Your seagull turned out so cute! Nice job there and the birdie clothespins is an adorable idea. I am going to remember that one. I love your cushion with the ever so cute seagull and the flags, Fiona!!! This cushion would be perfect for my sister's house, so I'd love to win that pattern. The Where shall we Adventure? Applique Ship is a close second. And of course I'm a follower. Thanks for the chance.. I really enjoyed your seagull very cute....and I have been a follower of Helen's for along time so there are way too many quilts that I love to name just one....thanks for the chance. Wow you have been having fun! The seagull is fabulous, especially with the bunting. And the birds on a wire are great - these would be fab for getting the kids to choose different colours. You could end up with a whole menagerie! Just been to the website to look at the patterns - there are so many great ones! I love the geese one and also the parrot one - my in-laws have a parrot so it would be great to make him a friend! I love your pillow, what a great gift, your birds on a wire are cute! Thanks for sharing! You did a great job with the seagull. I love those birds sitting on the line - very fun and festive! Love those birds on a wire!! The birds on a wire are adorable. I can see a few of those sitting on my clothesline. I also love the stacked teacups pattern on the webpage. Nice job on your projects! Oooh where do you find the artist transfer paper??!! There are things I could use this for! Great birds! I immediately was drawn to your blog name because I'm currently working on a celtic knot quilt! There's no stopping you now! You did a wonderful job on the seagull and the birdies! Love them all! Love love love the birds on a wire. 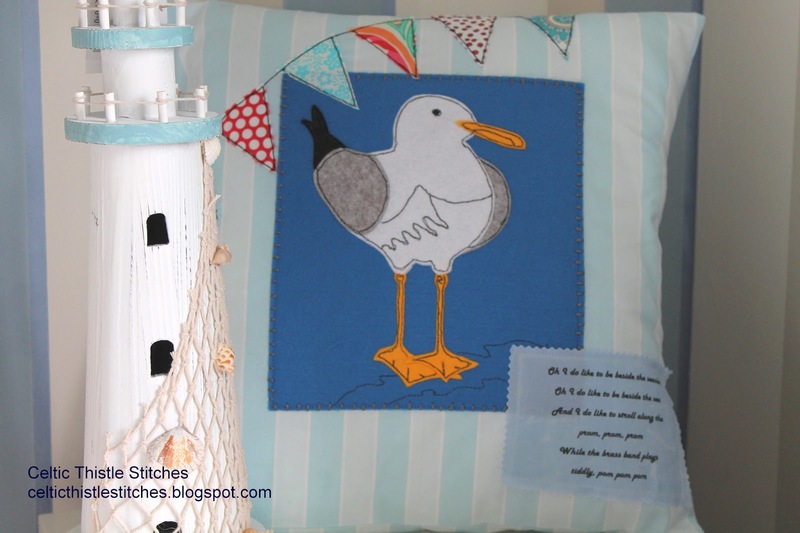 What a perfect gift for your family members---a seagull cushion to use in a lovely setting. The birds on the wire are so cute and what a neat way to up-cycle clothing bits. I visited Bustle and Sew and while there is a lot of real cool stuff up there (bookmarking!) I love that exotic hobo bird tote. Love stitcheries and the bag is just cool. THX for the opportunity for your giveaway. Your seagull pillow is fantastic! The birds on a wire are cute too. I love your projects. They are all very nice. They make me smile. I am a follower of you and I follow Bustle and sew. I have several patterns I would love to make, but really like the Aviator Mice and and the Deer Head. Thank you for the chance to win a great giveaway. I would like to make the Tea Cosy with the nasturtiums all over it. Very pretty. Love your seagull cushion and those sweet little birds on the wire are oh so cute. Thanks for sharing and the chance to win. 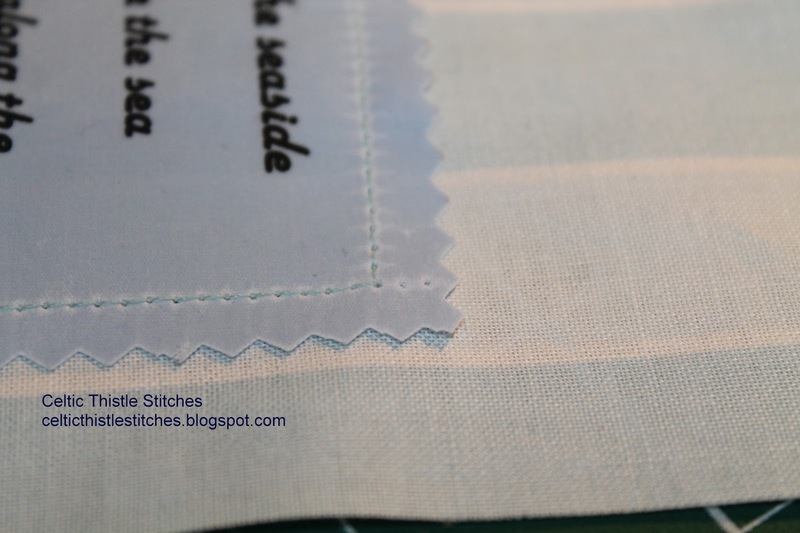 Your stitching is beautiful on your projects. I love those birds on a wire and your pillow is too cute! I checked out Bustle and Sew...nice site! The Wash Day Elephants were sweet looking. Thanks for hopping with us! That is really lovely and it makes such a wonderful thank you gift. The Birds on the line are beautiful. I loved the Coastguard Cottages at her site too. I love the seagull pillowcushion and those birds on a wire are so cute. I would like to try making Harvey the terrier. He is really cute too. I have not done too much applique with raw edges so it would be a new challenge for me. Lovely projects, the pillow is adorable and a lovely gift. The birds on a wire are really sweet. Love the cushion and the cute little birds. Love the seagull. We have them here too and there is no big body of water for at least 1000 miles. They hang out in the parking lot of the grocery store. I find that very strange! Darling seagull. Thanks for the link to Bustle and Sew. I signed up for her newsletter too. I would like the Bowl of Nasturtiums tea cozy. That's a pretty one. 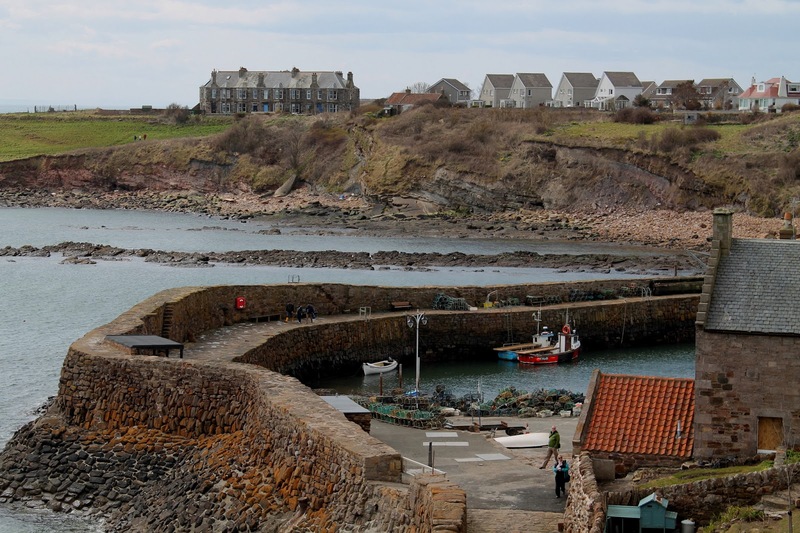 Love your pictures of Scotland. Your birdy projects are great. I subscribe to Helen's newsletter, but we are in the process of moving, so I am not planning any new projects, just trying to finish up many old ones. From California, thanks for sharing. Love your projects!!! Great job! Love the hedgehogs and the aviator mice. Love your projects. Both are terrific! Congrats on being one of the chosen. Great projects - I love the seagull! I can't choose between the 'birdie beach bag' and the 'exotic hobo bird tote'!! Your little banner pillow is adorable! I like the Nasturcium pillow pattern on Bustle and Sew. Your pillow is too cute and I love the clothespin birdie idea! I already get helen's Newsletter! Fantastic cushion present! And the birds on the wire are hilarious! In the Bustle and Sew store I think the Summer Birdie Bag is awesome and I love the Swan Softies too! Love your birds on a wire! They look like ladies all dressed up for a girls night out. Love the birds on the wire and the cushion is a terrific gift. I went to Bustle and Sew and love her messanger bags. Hi!!! Love your birds!!!! The seagull is very pretty!!!! The clothespin birds are adorable!!!! Hi!!! I am a happy follower and I get Helen's newsletter too!!!! She always has lots of cute patterns!!! 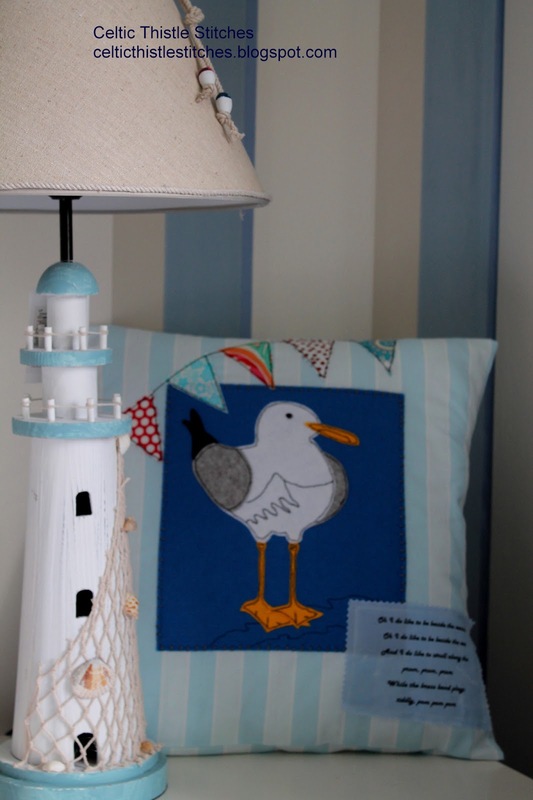 Loved your pics of Scotland's coast and I thought your seagull cushion/pillow was so wonderfully done. You are very adventurous to try two new techniques for a hop! I am impressed! Actually, the needle holes remind me of an entredeau stitch. Your cushion is so wonderful. What a nice gift. Congratulaions on being a top 3 today. Your birds are fun and make me smile. For the giveaway, Oh, how I would love to make the fabric deer head. I love the bird pillow and the coast gaurd cottage, tea cups too. Everything so cute. Love your bird projects. I would love to win the birds on a wire pattern. Oh my word....I love those gossiping birds ! I REALLY would love to win those ! Congrats on your win today !! Hi, I like the hoots the baby owl pattern. I love the look of the Calendar Bunnies Quilt Pattern and would want to add to my collection. I think it would a wonderful winter project and besides that I LOVE combining stitchery with piecing. Thank you for the chance to win such wonderful patterns! And for sharing your awesome view pictures and delightful bird projects. Oh My Love your birds on the wire. I would clothes pins on them with a magnet to hold shopping list etc on the fridge. Thank you so much for sharing theses wonderful feathered friends with us and for the chance to win such wonderful patterns. Eep! 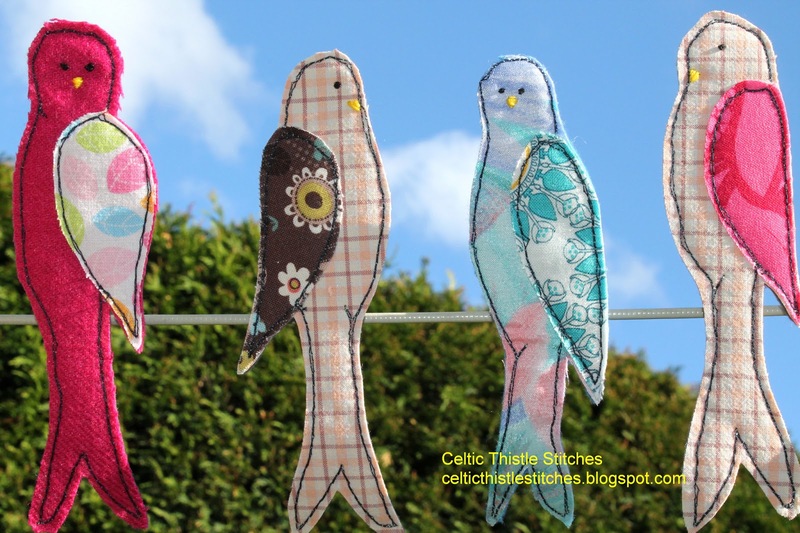 I love all of these little birdie projects :-D Those Birds on a Wire are too cute! Oh Fiona, I don't know how I missed this post. Those birds are absolutely stunning! That seagull is awesome!